High quality, brass spotlight designed to accept LED MR16 Lamps. 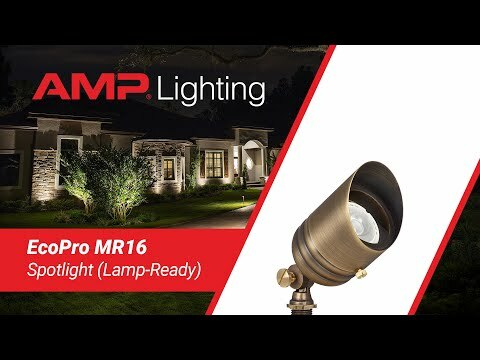 The brass AMP® EcoPro MR-16 Spotlight is the professional's go-to fixture for a full range of spotlighting needs. Designed to accept the AMP® line of LED MR-16 lamps, this compact fixture is engineered for durability and a number of high-performance features. •Brass construction with antique bronze finish for durability and long term beauty. •Knuckle with hefty brass set screw for precise aiming and secure locking. •Raised, flat lens prevents water from puddling, reducing hard water build-up and water intrusion. •Water tight, silicone O-ring prevents water from entering the luminaire. •Adjustable glare guard to prevent direct glare and to minimize light trespass and light pollution. •Backed by Lifetime Warranty (for both residential and commercial projects).